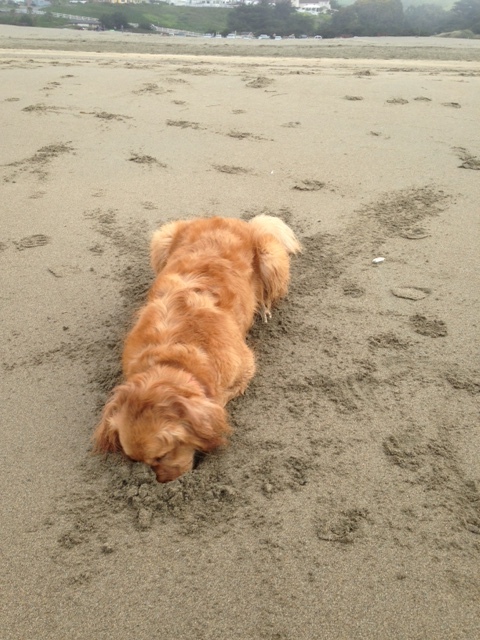 Follow your nose … wherever it takes you! In a recent conversation, a friend described her memories of her grandparents’ house — each room had, obviously, a visual memory, but also a unique scent memory. Many people have experienced being transported back to a meaningful childhood moment upon smelling a familiar scent — Grandma’s perfume, cinnamon rolls, Thanksgiving turkey roasting … But until I read Dr. Gregory Berns’s study “Scent of the Familiar,” I hadn’t really thought of memories, scents, and dogs in the same context. This study, published in the journal Behavioural Processes in 2015, shows that dogs have a pleasurable association with some scents. Berns’s team analyzed MRI scans of several dogs, comparing their brain response to sniffing the scents of familiar and unfamiliar people and dogs. The dogs were all trained, using only positive methods, to lie still in MRI machines, as described in Berns’s book, How Dogs Love Us. What the team found was that, while the scent-processing areas of the dogs’ brains responded similarly to all the scents, only the scent of a familiar human triggered a strong reaction in the “pleasure center” of their brains. The study was carefully controlled — the scents were from people in the dogs’ households but not the dogs’ primary caregivers and not individuals who were present in the lab for the testing. Berns compares the dogs’ ability to recognize and happily respond to the scent of a loved but distant human to the response humans show when viewing photos of loved ones who are not present. In simple English, this study confirms that dogs, like my friend, can experience pleasant memories via scent. It makes perfect sense, since dogs’ ability to detect and identify scents is so powerful. Humans tend to rely more on visual cues to identify and remember places, people and, maybe, dogs. But dogs are far less visually oriented, and their eyesight works differently from ours — fewer colors, more emphasis on shadows and movement, for example. It also most likely explains how dogs remember people they have not seen in a very long time. As a student at Bergin University (then called the Assistance Dog Institute), I trained a young puppy, from her birth to about 13 weeks of age. Cassie was a brilliant puppy, and we spent time together every day. Then, the semester ended, and I left for my home. I did not visit the school again until a year and a half later. I knew that Cassie was still there, but there was no way that I could pick out this now-grown golden retriever from a sea of beautiful, but very similar-looking, goldens. I’m sure I looked different too, but she had no trouble recognizing me. I quickly guessed that the enthusiastic, whole-body-wagging-with-joy girl who was leaping into my arms was Cassie. The nose knows!